Nevada and Delaware online poker players live in two of the first states to regulate the game, and now they will soon be able to compete against each other in the same games. 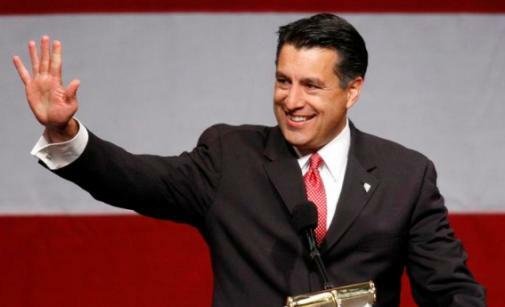 Governor Brian Sandoval of Nevada said that state gaming regulators have told him that the implementation of an interstate compact between the two states is “imminent,” and that poker players can expect to see their cross-country opponents on the virtual felt in about four to six weeks. The agreement, signed between Sandoval and Delaware Governor Jack Markell last February, will improve the player pools for sites in both states. According to Sandoval, the implementation of the shared player pools has been delayed due to technical glitches, but those problems have apparently been resolved. Player pool sharing is seen as a potentially critical step if online poker continues to spread throughout the United States on a state-by-state basis. While larger states such as New Jersey (and especially potential players in the online poker world like California and New York) can support the game to various extends on their own, smaller states will need to combine their player pools to build a level of liquidity that makes it worthwhile for people to play the games. Even larger states will likely benefit if player pools are combined, as it will allow more games at various stakes to run, especially in off-peak hours. That’s why the biggest winner of this agreement is likely to be Delaware. While Nevada is a small state in its own right, being the home to Las Vegas gives it something of an edge while building a player pool for online poker. Not only is Delaware even smaller, but it lacks the same level of gambling culture. The result is that there are rarely more than a couple dozen cash game players in Delaware’s online poker room (shared between three racetrack casinos in the state) even during the busiest hours, making it hard to convince people to play on the site. But bringing in players from Nevada, where there are often hundreds of people playing online poker, will give Delaware players more incentive to try the games out. Meanwhile, Nevada’s games will benefit from the boost in traffic as well, allowing them to spread more games and offer bigger guaranteed prize pools for their tournaments. Another big beneficiary of the player pool merger will be 888 Holdings. The company is the sole provider of online gambling products in Delaware, making it the only firm that could possibly link games between the two states. Meanwhile, 888 also provides software for WSOP.com, which is virtually the only competitor left in the Nevada market. That means that virtually all Internet poker players in the two states will be playing using 888 software, all combined on a single network. That situation could get even better for 888 if the company is able to get its own branded poker site up and running in Nevada. There’s also talk of a coming Treasure Island online poker room that would also use 888 software. If all of these sites are running and are partnered with the 888-operated sites in Delaware, it may be difficult for other competitors to break into the market later on.